Don't know. But looks bad. Yeah, I am looking for stocks to buy. Also, a bounce is due, how high we shall see, and then we come to the midterms: this is decisive. Are traders and investors selling in anticipation of a negative election result? I normally don't show an in-progress monthly chart because a monthly chart isn't final until the end of the month, but this week's market action was so severe, I thought that a 'big picture' view would be most helpful. 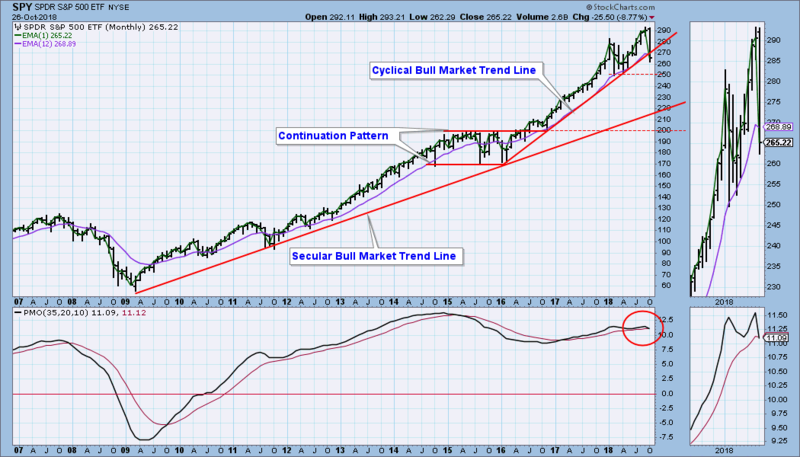 The cyclical bull market rising trend line drawn from the 2016 low was decisively violated this week with a breakdown of over -5%. A 'decisive' break (-3% or greater) carries with it the assumption that lower prices will follow. This assumption is reinforced by the fact that the monthly PMO has topped and crossed down through the signal line (EOM pending). There is horizontal support at this year's lows, but the next major support is on the secular bull market rising trend line, drawn from the 2009 low. A decline of about -25% from the all-time highs would take price back to that line, giving us a pretty tidy cyclical bear market. I'm not predicting that, but it is certainly a possible outcome. The most commonly watched support level is the 200-day simple moving average (SMA). I personally don’t care for the 200-day SMA, and haven’t even mentioned it in months because too many people are watching it. An indicator’s effectiveness decreases with its popularity. Look at any chart, and you’ll see the S&P 500 IndexSPX, -1.73% criss-crossed the 200-day SMA in seven of the past 10 trading days. A more effective — and less known — support level is the trend channel and 50-week SMA shown below. The green arrows show how often the 50-week SMA has acted as support in recent years. Last week, when the S&P 500 bounced from it, the 50-week SMA coincided with the black trend channel, which increased its predictive potency. Once broken, investors got spooked. Next support is around 2,640, 2,600 and 2,590. Support levels for the Russell 2000 Index RUT, -1.10% Nasdaq CompositeCOMP, -2.06% and Dow Jones Industrial Average DJIA, -1.19% are also not far below current trade. The main point is though, do not we need to really scare investors before we truly bottom ? We attempted to break out to new all time highs in the SPX, in October. Then that failed. Now we back within the range. Price oscillation suggests we swing right back down to Feb and March lows and then go UNDER them briefly. And by the way, I was SHOCKED to hear and listen to Larry Pesavento on Friday that he is NOT looking for a crash in this market at this time! Larry has been repeatedly predicting market crashes since the 2009 low every single time we are in a similar juncture as we are now. But he this time says it is not possible ! But of course now that means it IS possible, based on reverse logic. Edited by tradesurfer, 27 October 2018 - 10:00 AM. No market can move higher without leadership, and a small group of technology stocks have certainly been the outstanding performers in the market before the sell-off began. The so-called FAANG stocks, Facebook, Apple, Amazon, Netflix and Google (Alphabet) had returned 38% annually since 2014. These stocks have been hit hard in the recent decline. At this point, technology stocks appear more reasonably priced than in 2000. Then, tech was selling at a 200% premium to the general market; today the premium is 30%, according to Barron’s. Any forecasts have become confused by the revelation that Chinese operatives had inserted spy chips inside the servers used by Apple, Amazon and others, requiring costly surveillance going forward. In spite of this, the FAANG stocks are still expected to show strong growth next year ranging from a high of 56% for Netflix to a low of 12% for Google (Alphabet). Barron’s has assigned a risk rating to each of the FAANGs, based on factors such as trade, supply chain, valuation, privacy and regulation. On this basis, Facebook and Google are ranked worst and Netflix best, which is the opposite of my risk assessment. The February and October market corrections reflect the volatility risk stemming from the proliferation of passive and computer-driven programs. One such strategy, Risk Parity, popularized by firms like Bridgewater and AQR, has amassed over $400 billion in AUM. This approach makes allocations based on risk, rather than traditional stock and bond weightings. When volatility in one asset class increases, the portfolio is shifted to less volatile assets in order to maintain optimal risk levels, typically without much human intervention. Similarly, recent research suggests that 60%–90% of daily equity trading is now performed by algorithmic trading, up from 25% in 2004. Meanwhile, passive exchange-traded funds have directed trillions of dollars into equity markets since 2009, and the percent of the U.S. equity market share captured by passive strategies has increased from 26% at the start of 2009 to 47% as of 3Q’18. All of these trends are likely to increase volatility moving forward. One result is to discourage investors who base decisions on fundamentals like earnings, but feel that the market is being controlled by professionally run, computer-based forces which they do not understand and, in some cases, fear. Taking all of these factors into account, I believe we are going through a necessary correction prior to the next upleg, which should occur after the mid-term election, regardless as to whether the Democrats take control of the House of Representatives or not. Earnings will continue to drive the market and the prospects for earnings growth in the U.S. for 2019 remain strong in spite of what is happening elsewhere in the world.